CDHP works with states to increase oral health access for pregnant women and infants through the Perinatal and Infant Oral Health Quality Improvement (PIOHQI) National Learning Network. The following guest post is co-written by Jessica Bushar, Lindsay Handelsman and Danielle Garfinkel, our project partners from Text4baby. The service is provided in partnership by the nonprofit ZERO TO THREE and Voxiva. Expectant moms beam with a pregnant glow—and Text4baby is making sure this glow includes a bright and healthy smile for both mom and baby. Text4baby—a free, national mobile health program that provides health tips and resources to pregnant and postpartum moms—recognizes the importance of oral health in pregnancy and infancy. The service is both an innovative resource for moms-to-be and a valuable tool for advocates to inform policymakers about pregnant women and new moms. Changes to the gums and teeth during pregnancy increase the risk of dental problems. If left untreated, these can cause health problems for both mom and baby. However, less than half of pregnant women go to the dentist: some lack insurance, but others may simply not know that it is safe and important to go during pregnancy. 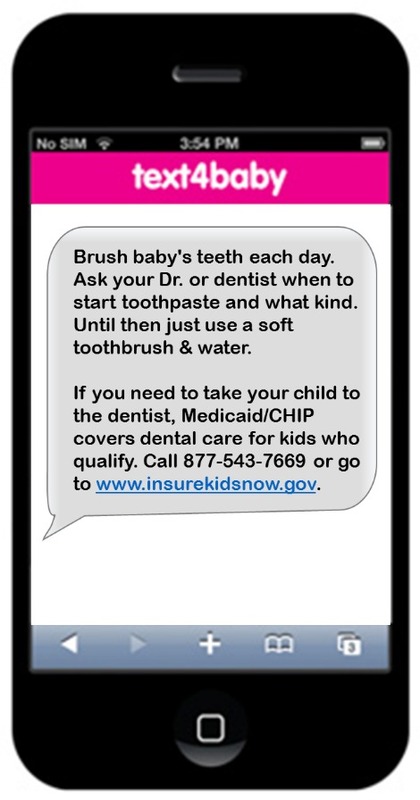 Text4baby connects moms with oral health education and resources during this critical time. Moms may wonder about the safety of dental x-rays while pregnant or when to take a baby to the dentist for the first time. Timed to a user’s due date or the age of her infant, Text4baby shares timely information on these oral health topics and more, including nutrition during pregnancy, gum disease during pregnancy and baby’s oral hygiene. As one Text4baby mom explained, “A lot of the notifications were given at just the right times…the oral health texts came at a great time because I had no clue of how to clean my baby’s gums.” Text4baby also provides resources to connect moms and babies to health and dental coverage. As a partner, you also gain access to a data dashboard displaying aggregate national and state-specific trends, as well as the Text4baby data portal, which includes real-time data for participants who have enrolled in your state. Partners can access individual-level records with information on participant demographics, such as language, zip code and county, as well as other data on how participants are finding out and engaging with the service, like reported referral source. This resource has allowed Text4baby and partners to track and document the success of promotional efforts and tailor outreach to local moms. Armed with this resource, partners can demonstrate the reach of Text4baby and its oral health messaging among underserved populations who are at risk for poor health in their state. Through our 1,400 partners, Text4baby has enrolled more than 950,000 moms to date. Sign up to learn more about how you can advocate for good oral health with Text4baby. Together, we can keep moms and babies smiling.